The Madurai Bench of the High Court has converted the multiple Thoothukudi FIRs into witness statements. The Madurai Bench of the High Court of Madras has passed an Order partly allowing two Writ Petitions which challenge the police action following the anti-Sterlite protests in Thoothukudi. The Division Bench comprising Justices CT Selvam and AM Basheer Ahmed declined to declare the First Information Reports (FIR) filed as null and void, but allowed them to be treated as statements made to the police under section 161(3) of the Code of Criminal Procedure (CrPC). One petition was filed by A John Vincent and the second by D Ponpandi. Both petitions had prayed that the multiple FIRs filed against the protesters should be declared null and void. They also prayed that these FIRs should be treated as statements made to a police officer under section 161(3) of the CrPC. Since the relief sought in both petitions was the same, the Bench passed a single Order for both cases. Section 161(3) of the CrPC deals with statements made to the police by a witness. The implication under this section is that an FIR has already been registered and that the person making statements is only aiding the investigation. On May 22 this year, discontentment had reached new heights in Thoothukudi – also known as Tuticorin – in Tamil Nadu. A subsidiary of the infamous Vedanta, Sterlite was set to expand its polluting copper smelting plant. Protests against the expansion had been mounting since February. On that day, the people of Kumarediapuram, Therku Veerapandiayapuram, Pandarampatti, Meelavittan, Madathur, Matha kovil area, Mattakadai, Terespuram New Street, Fathima Nagar, and Lions Town areas assembled to protest against the Sterlite plant. The plant had been established in 1996. However, in 2010, the Madras High Court had ordered its closure as it had violated environmental laws. In 2013, the Supreme Court allowed the plant to resume its activities after imposing a Rs. 100 crore-fine for polluting the environment. Due to the effluents from the plant, the people living around it have suffered from asthma, pharyngitis, sinusitis and other respiratory tract infections which occur due to toxic gases in the lower atmosphere. In addition, there have been an unusually large number of menstrual disorders like menorrhagia and dysmenorrhea occurring in the area. What initially was intended to be a peaceful protest against the plant's expansion turned into a textbook example of police brutality when the police opened fire on the unarmed protesters. The protesters alleged that the police had designated sharp-shooters to target 'trouble makers', no doubt a euphemism for activists. Following the shooting, a media storm erupted. 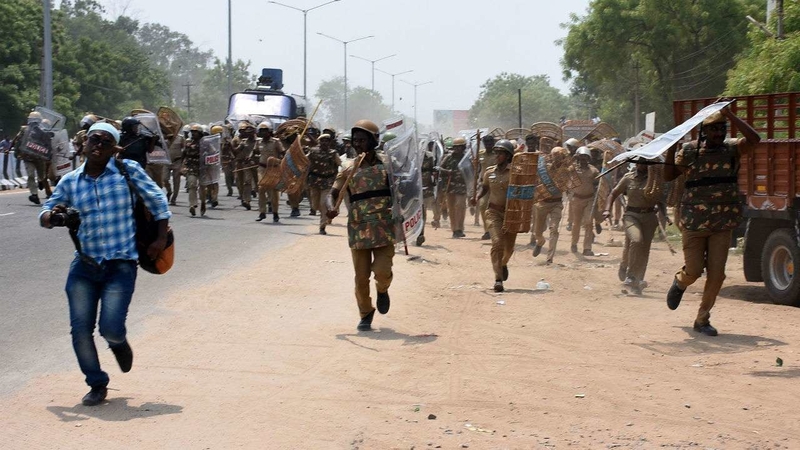 Opponents of the government in Tamil Nadu were barred from entering the area, ostensibly because it would violate the proclamation under section 144 of the CrPC. Self-anointed 'godman' and consumer goods mogul, Baba Ramdev, however, voiced support for Vedanta, terming the protests as an 'international conspiracy'. The Tamil Nadu government fearing a further backlash from the people finally relented and ordered that the plant be shut down on May 28. However, the story had not ended. According to the petitioners, the police had registered multiple FIRs against those involved. One person was named in 100 FIRs and another in 85. All the sections under which the FIRs were filed would result in the accused's arrest. This means that if they were able to secure bail in connection with one FIR, they could still be arrested under another. According to the Order, the counsels for the respondent state did not deny that a particular individual was implicated in multiple FIRs. Instead, they sought to justify this phenomenon by citing numerous events ranging from damaging public and private property to arson.